Many people find statistics scary. I know I used to. Stats were just a lot of numbers that didn’t appear to make sense or seemed to give contrary outcomes. Sometimes they were up (very exciting) and sometimes they were down (very depressing). Some people don’t even look at what their stats are and prefer not to know how they are doing. They fly their practices by the seat of their pants. And then they wonder why they don’t take home as much pay as they should for all their hard work. Factually statistics, once you understand that they just represent an amount of something that was produced, can become your most useful tool to control the quality and quantity of the service delivered in your practice. They are indeed your biggest stress reducer tool once you know how to work with them. For instance, let’s say you normally get 3-4 new patients per week. Six weeks ago you sent out a mailing and this week you got 13 new patients. This means your mailing worked as there is always a lag between outflow and inflow. The next week, your new patients’ stat drops to 3. What does this tell you? Answer: You should get some more of that mailing out the door right away and keep it going week after week until the return numbers drop off which means the mailing is no longer biting. Never, ever drop doing a promotional action nor change its colour, style, and type until it no longer works. Then do something new and see if it works by watching the stats. One area of your practice that produces income suddenly drops and another area skyrockets up through the roof. Which one should you pay attention to? For best results, you should find out precisely what caused the stats to soar in the one area and ensure that those same actions are repeated and kept going. Then, look into the area where the stats dived and investigate to find out what made it worsen and get rid of whatever caused it. One of your staff is getting faster and better at her or his job and this is causing the practice to increase. How do you keep that improvement going? Rewards based on up statistics. Always reward increased production and results. Never give a bonus or reward of any kind if the stats are down. That would cause the morale to drop. Become an expert at managing by statistics and watch your stress levels drop and your take home pay escalate. Statistics don’t bite … quite the reverse: not knowing and operating with statistics is what takes the bite out of your remuneration for all your hard work. We offer two short courses on stat management for practices and by applying the tools you learn, you will make a huge difference in the production and efficiency levels of your practice. Contact us for more information. 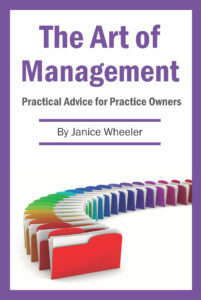 Referrals to Specialists Do you have a manifesto for your practice?